Linsk at SKH Studios in Florida and was mastered by Roger Lian at Masterdisk in New York. 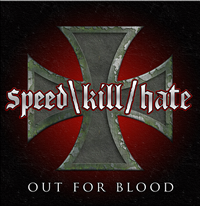 The record includes 10 new tracks of brutal thrash metal, and should satisfy all of those who love this style of music. To all of you who have allready pre-ordered Out For Blood we would like to thank you all for your orders. All pre-orders have now been shipped out . Don't be afraid to "Spread the Hate". Hammerfist Records is now in talks with several bands and we will be announcing additional releases in the upcoming weeks. We kere at HFR have also have aquired the sevices of Skateboard Marketing and Promotion to handle releases throughout all of our metal divisions. As we continue to grow here at HFR, addtional content and services will be added to both our news page and services page. We will keep things updated as we progress and obtain more information for you.